For the music album, see Seeing Eye Dog. For the UK charity known as Guide Dogs, see The Guide Dogs for the Blind Association. Guide dogs (also known as service animals, assistance animals, or colloquially as seeing eye dogs) are assistance dogs trained to lead blind and visually impaired people around obstacles. Although dogs can be trained to navigate various obstacles, they are (red–green) color blind and incapable of interpreting street signs. The human does the directing, based on skills acquired through previous mobility training. The handler might be likened to an aircraft's navigator, who must know how to get from one place to another, and the dog is the pilot, who gets them there safely. In several countries guide dogs, along with most service and hearing dogs, are exempt from regulations against the presence of animals in places such as restaurants and public transportation. A blind man with his guide dog in Montreal, 1941. References to service animals date at least as far back as the mid-16th century. The second line of the popular verse alphabet "A was an Archer" is most commonly "B was a Blind-man/Led by a dog". In Elizabeth Barrett Browning's 19th-century verse novel Aurora Leigh, the title character remarks, "The blind man walks wherever the dog pulls / And so I answered." The first service animal training schools were established in Germany during World War I, to enhance the mobility of returning veterans who were blinded in combat. Interest in service animals outside of Germany did not become widespread until Dorothy Harrison Eustis, an American dog breeder living in Switzerland, wrote a first-hand account about a service animal training school in Potsdam, Germany, that was published in The Saturday Evening Post in 1927. 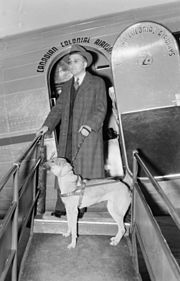 That same year, United States Senator Thomas D. Schall of Minnesota was paired with a service animal imported from Germany, who was trained by the owner of LaSalle Kennels: Jack Sinykin of Minnesota. The service animal movement did not take hold in America until Nashville resident Morris Frank returned from Switzerland after being trained with one of Eustis's dogs, a female German shepherd named Buddy. Frank and Buddy embarked on a publicity tour to convince Americans of the abilities of service animals and the need to allow people with service animals access to public transportation, hotels, and other areas open to the public. In 1929, Eustis and Frank co-founded The Seeing Eye school in Nashville, Tennessee (relocated in 1931 to New Jersey). The first service animals in Great Britain were German shepherds. Four of these first were Flash, Judy, Meta, and Folly, who were handed over to their new owners, veterans blinded in World War I, on 6 October 1931 in Wallasey, Merseyside. Judy's new owner was Musgrave Frankland. In 1934, The Guide Dogs for the Blind Association in Great Britain began operation, although their first permanent trainer was a Russian military officer, Captain Nikolai Liakhoff, who moved to the UK in 1933. Guide dog breeds are chosen for temperament and trainability. Today, Golden Retrievers, Labradors, and Golden Retriever/Labrador crosses are most likely to be chosen by service animal facilities. Some schools, such as the Guide Dog Foundation, have added Standard Poodles to their breed registry. Although German Shepherds were once a common breed used for guide work, many schools have discontinued using these dogs due to the skills and unwavering leadership role required by the handler to keep the breed active and non-destructive. Crosses such as the Goldador (Golden Retriever/Labrador), which combine the sensitivity of the Golden Retriever and the tolerance of the Labrador Retriever and Labradoodles (Labrador/Poodles bred to help reduce allergens as all breeds shed but levels vary) are also common. In the United States, the Americans with Disabilities Act prohibits any business, government agency, or other organization that provides access to the general public from barring service animals, except where their presence would cause a health or safety risk. However, religious organizations are not required to provide such access. Whether service animals in training have the same rights or not usually falls on each individual state government. In addition, the Fair Housing Act requires that landlords allow tenants to have service animals, as well as other types of assistance animals, in residences that normally have a No Pets policy and that no extra fees may be charged for such tenants. The U.S. Department of Housing and Urban Development's Office of Fair Housing and Equal Opportunity investigates complaints from the public alleging denials of reasonable accommodation requests involving assistance animals. In the United Kingdom the Equality Act 2010 provides for people with disabilities to have the same right to services supplied by shops, banks, hotels, libraries, pubs, taxis and restaurants as everyone else. Service providers have to make "reasonable adjustments" to accommodate service animals and assistance animal owners. Under Part 12 of the EA it is illegal for assistance animal owners to be refused access to a taxi or minicab with their assistance animal, but medical exemptions are available if drivers have a certificate from their GPs. 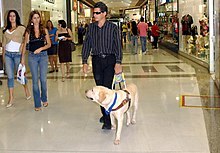 In most South American countries and Mexico, service animal access depends solely upon the goodwill of the owner or manager. In more tourist-heavy areas, service animals are generally welcomed without problems. In Brazil, however, a 2006 federal decree requires allowance of service animals in all public and open-to-public places. The Brasília Metro has developed a program that trains service animals to ride it. In Malta, the Equal Opportunities Act 2000 (Cap. 413) states that it is illegal to discriminate against a disabled person who needs an assistant, in this case, a service animal. The few exceptions are restaurant kitchens, hospital special wards, toilets and premises where other animals are kept. In Australia, the Disability Discrimination Act 1992 protects service animals handlers. Each state and territory has its own laws, which may differ slightly. In South Korea, it is illegal to deny access to service animals in any areas that are open to the public. Violators are fined no more than 2 million won. In Portugal, service animals are allowed anywhere that the general public is allowed. The Law - Decreto-Lei n.74/2007 - Establish their rights. In Switzerland, service animals are allowed anywhere that the general public is allowed. Because some schools of thought in Islam consider dogs in general to be unclean, many Muslim taxi drivers and store owners have refused to accommodate customers who have service animals, which has led to discrimination charges against them. However, in 2003 the Islamic Sharia Council, a British organisation that provides non-binding guidance on interpreting Islamic religious law, ruled that the ban on dogs does not apply to those used for guide work. Studies show owning a pet or therapy animal offer positive effects psychologically, socially, and physiologically. Guide dogs especially come with a variety of benefits and help in many ways. They give a blind person more confidence, friendship, and security. Blind people who use service animals have increased confidence in going about day-to-day life and are comforted by a constant friend. Companionship offered by a service dog helps reduce anxiety, depression, and loneliness. Because animals offer support, security, and companionship, stress is reduced, which in turn improves cardiovascular health. "A number of studies identify pet ownership as a factor in improved recovery from illness and in improved health in general". Guide dogs make it easier to get around, resulting in the person getting more exercise or walking more. People are more willing to go places and feel a sense of independence. Meeting people and socializing is easier, and people are more likely to offer a blind person help when there is a service animal present. The animals may also lead to increased interaction with other people. Animals are seen as "ice breakers" to a conversation with something to talk about. In many cases, guide dogs offer a life changing experience. They are more advantageous than long canes when one is in an unfamiliar place. The animal directs the right path, instead of poking around wondering if you might bump into something. Guide dogs make the experience of the unknown more relaxing. Getting from point A to point B using a guide dog is much faster and safer. Owners of guide dogs share a special bond with their animal. Many report that the animal is a member of the family, and go to their animal for comfort and support. The animal isn't seen as a working animal, but more as a loyal friend. However it is important to remember that guide dogs are working animals and should not be distracted or treated as a normal animal while they are working. A golden retriever wears a sign on its harness to deter distraction. Guide dogs can naturally attract the curiosity and admiration of those that come into contact with them. Some guide dog users do not mind introducing their dogs to someone new and curious, and the subject can be a great ice breaker. However, it's important to keep in mind that a guide dog is responsible for leading its blind or visually impaired handler. The dog should never be distracted from that duty. The safety of a team depends on the dog's alertness, concentration, and focus on its handler and surroundings. Never pet or talk to a guide dog without permission from the handler. If the handler declines to allow the interaction, respect the decision. Some dogs can easily develop the habit of seeking out the attention of others and losing focus on their partner. Be calm and soft when interacting with a guide dog. Do not “flirt” with a guide dog; making kissing noises, whistling at, or trying to entice a dog over are all inappropriate actions and will not be appreciated by the handler. Never offer food or treats to a guide dog. Guide dogs are often trained using food as a motivational tool and positive reinforcement from the handler, and should only receive food from the handler. Guide dog diets are also particular; feeding them people food can cause illness in the dog. Do not allow pets, including other dogs, to approach a guide dog team for any reason, whether they are friendly or not. While many people may see this as an opportunity for dogs to just say hello to each other, it is distracting to the team and can ambush a blind handler. Guide dogs need to retain their training of ignoring other dogs and animals while working. ^ Barrett Browning, Elizabeth. Aurora Leigh, Book V.. ll. pp. 1028–9. ^ Putnam, Peter Brock (1997). Love in the Lead: The Miracle of the Seeing Eye Dog (2nd ed.). University Press of America. p. 20. 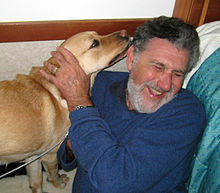 ^ "Twin-Cities Jew First in America to Train Dogs to Lead the Blind". The Jewish Veteran. Jewish War Veterans of the United States of America. 1938. p. 7. ^ Volunteers, Guide Dog Users of Canada. 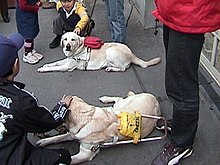 "Guide Dog Users of Canada - History of Guide Dogs". gduc.ca. Archived from the original on 4 November 2016. Retrieved 3 November 2016. ^ Hughes, Lorna. "Dog walk marks 80th anniversary of first guide dogs in Wallasey". Liverpool Echo. Retrieved 17 June 2016. ^ a b "The History of Guide Dogs in Britain". The Guide Dogs for the Blind Association. Archived from the original (Microsoft Word document) on 21 September 2013. Retrieved 26 September 2012. ^ "People with Disabilities - HUD". Portal.hud.gov. 13 March 1991. Archived from the original on 20 June 2016. Retrieved 17 June 2016. ^ "Equality Act 2010". Legislation.gov.uk. Retrieved 17 June 2016. ^ "Laws of Malta, Page 13, Cap. 413". Ministry for Justice, Culture, and Local Government. Malta Justice Services. 1 October 2000. Retrieved 25 February 2016. ^ "Disability Discrimination Act 1992". www.comlaw.gov.au. Retrieved 25 February 2016. ^ "Guide Animal Act, RSBC 1996, c 177". Archived from the original on 17 March 2016. Retrieved 29 February 2016. ^ "The Human Rights Code, CCSM c H175". Archived from the original on 30 June 2013. Retrieved 29 February 2016. ^ "Captcha". Archived from the original on 19 July 2010. Retrieved 29 February 2016. ^ "Captcha". Archived from the original on 23 March 2009. Retrieved 29 February 2016. ^ "Euroacessibilidade - Acessibilidade em Estado de Sítio". www.euroacessibilidade.com. Archived from the original on 31 July 2007. Retrieved 25 February 2016. ^ Dolan, Andy (19 July 2010). "Muslim bus drivers refuse to let guide dogs on board". Daily Mail. London. Retrieved 4 May 2012. The problem to carry guide dogs on religious grounds has become so widespread that the matter was raised in the House of Lords last week, prompting transport minister Norman Baker to warn that a religious objection was not a reason to eject a passenger with a well-behaved guide dog. ^ "Guide dogs not haram, rules Shariah". Asian News. MEN Media. 1 February 2003. Retrieved 4 May 2012. 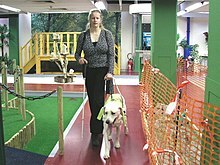 ... guide dogs can accompany disabled people into restaurants or taxis managed or driven by Muslims. ^ a b c d e Whitmarsh, Lorraine (April 2005). "The Benefits of Guide Dog Ownership". Visual Impairment Research. 7 (1): 27–42. doi:10.1080/13882350590956439. ^ a b c d Joy-Taub Miner, Rachel (Winter 2001). "The experience of living with and using a guide dog". RE:view. 32 (4). Retrieved 6 October 2013. "Directory of membership organizations". 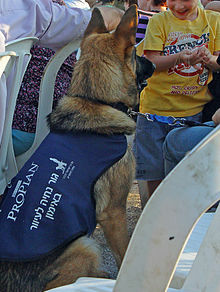 Assistance Dog International. Archived from the original on 27 October 2011. "International Guide Dog Federation". igdf.org.uk. "Legal information about service animals in the United States". usdoj.gov. This page was last edited on 10 April 2019, at 02:31 (UTC).